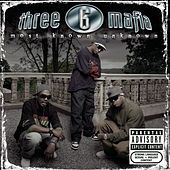 They claimed to be the "most known unknown" because, despite selling millions, the mainstream refused to acknowledge them; this was Three 6 Mafia's biggest album to date. DJ Paul and Juicy J turn "Stay Fly" and "Poppin' My Collar" into pop hits by using sampled melodies, but for the most part they stick to familiar screwed-up thug chants like "Swervin'" and "Don't Violate." A decade ago, their unrepentant gangster lifestyle consigned them to the industry margins, but by 2005 the world had caught up. "'Tear Da Club Up' was the first crunk fight song," DJ Paul reminds us on "Body Parts 3." On Most Known Unknown, the Memphis pioneers collect their due.